As many of you know, about a month away will be the premiere of a brand new Dragon Ball Z movie, Battle of The Gods. There's a bunch I can talk about with the movie, like how it's between Z and GT, how there'll be a Super Saiyan God Form, and more...but...this is great. 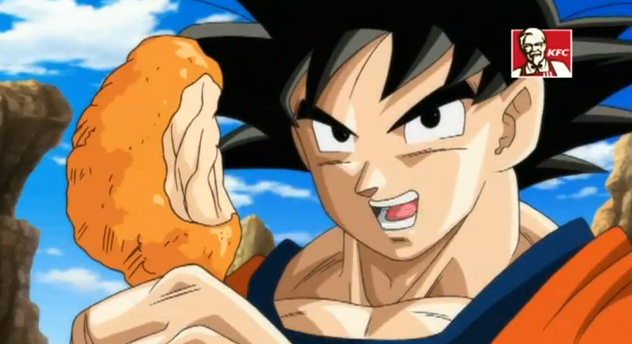 Seems KFC in Japan is doing a promo for the movie with glow-in-the-dark-topped DBZ bottles. Of course, there's a commercial. Would love it if places here in the states would promo anime like this. Just one bite Goku? We know, you'd scarf that and a whole bucket in a second.